Like to wear your heart on your sleeve (or your mug, or your hoodie)? Shot Dead In The Head specialise in products that let the world know exactly what you're thinking – and with a Shot Dead In The Head discount code you can make a statement for less. So whether you want a funny t-shirt that's sure to raise a smile or a mug for that boss you love to hate, a Shot Dead In The Head discount code will save you money while you shop. Shot Dead In The Head was founded in 2007, making and selling a wide range of garments via Amazon in the UK, France, Germany, Italy and Spain as well as their own website. From their best-selling first product – the tongue-in-cheek 'Make Bono History' t-shirt that featured on Vogue's Top 100 Cool List - they've grown to become one of the country's most popular novelty clothing brands, with over 100,000 garments delivered every year. At Shot Dead In The Head you'll find a wide range of t-shirts, hoodies, mugs and more, all emblazoned with fun and witty slogans straight from the world of pop culture. There are 8 different garments styles in 10 difference colours to choose from, and more than 3,000 designs in total – so you're sure to find something that makes you smile. Many of Shot Dead In The Head's products are officially licensed designs for huge brands such as Breaking Bad, Game of Thrones and Sons of Anarchy, with all of these products printed on premium organic garments. Alongside these there's a fantastic range of slogans and designs for you to choose from, including quotes from your favourite films, offensive slogans, nerdy in-jokes to indulge your inner geek and much more. Want to shout out loud your love for a certain TV show? Shot Dead In The Head have plenty of products that will mark you out as a fan. Or perhaps you want to start conversation at a party with a witty t-shirt? Whether you want something laugh-out-loud or a little more subtle, there's something to suit every sense of humour. As well as adult's clothing, Shot Dead In The Head also stock a selection of t-shirts for children – so you can help your little ones take their first great steps into the world of fashion. There's even a dedicated blog that keeps you up to date with all the latest news and gossip from your favourite pop culture trends, and a 'rogue's gallery' where you can see selfies of satisfied customers showing off their Shot Dead In The Head wares. Want to get shopping with Shot Dead In The Head? With a Shot Dead In The Head discount code you can enjoy fantastic savings on their wide range of novelty t-shirts, hoodies, mugs and more. So whether you're looking for a treat for yourself or a present for a friend, a Shot Dead In The Head discount code will help you save the pennies. Choice of 8 garment styles in 10 different colours. If you've enjoyed shopping with Shot Dead In The Head, you might also like to check out more great deals on clothing and more at stores like Urban Outfitters or Topshop. Or, if those aren't up your street, you'll find plenty more deals to browse in our Fashion, Accessories and Jewellery section. When you're finished shopping, click 'Check out now'. Enter your Shot Dead In The Head discount code in the box provided and click 'Apply discount code'. Review your order and click 'Check out securely'. Standard UK delivery costs just £2.99, with options for express delivery for a small additional fee. If you need to return a product for any reason to Shot Dead In The Head, you can do so by simply returning your items in their original condition within 90 days of receipt. Need to speak to the team at Shot Dead In The Head? Whether you have a question about your order, want some expert advice on choosing the perfect present or just want to find out more about how you could make fantastic savings with a Shot Dead In The Head discount code, you can contact the Customer Services department by accessing the online contact centre here. Want to find out more about Shot Dead In The Head? Why not follow them across your favourite social media networks for access to exclusive content such as competitions, new product previews, fun articles and more. You can also use these pages to find out more about saving money with a Shot Dead In The Head discount code. Don’t forget to check them regularly, as you can never be sure when a free Shot Dead In The Head discount code might be waiting for you! Buy now online at www.shotdeadinthehead.com. I was struggling to find a present for my teenage nephew - then I discovered a Shot Dead In The Head discount code online. 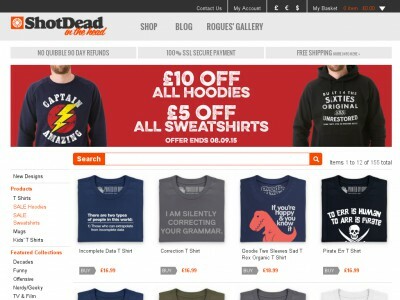 At shotdeadinthehead.com they stock a wide range of t-shirts and more emblazoned with fun slogans from the world of popular culture – and all available at a fantastic price with a Shot Dead In The Head discount code. I used my Shot Dead In The Head discount code to get a great deal on a t-shirt inspired by his favourite TV show! So why not get shopping with a Shot Dead In The Head discount code?